My impaired vision cannot cope with brightly coloured carpets or patterned wallpaper, so our house is very plain in neutral colours. The busy, lived-in look or clutter, if you like, keeps it interesting and homely. A small wall between the kitchen and the back room needed something. I’ve avoided putting any pictures on that particular wall since one of my cross-stitch artworks was almost ruined when the bathroom wash basin overflowed directly above. Water streamed down the wall and trickled from the light-fitting. Our daughter was the culprit, a young child at the time. We removed the plugs from every sink and basin and implemented an ‘ask if you need it’ policy which remained in place until the children had grown up. All our replaced sinks have built in plugs now. I will keep a close watch on our grandchildren. We decided to have wallpaper, just on that small area. I liked the idea of something bright, jazzy and loud, to make a feature of it. My eyes would be fine, after all, it’s only one, very small wall. Huge, red poppies interlaced with pale green leaves on a white background looked stunning and I loved it. All visitors remarked on how nice it was and I felt very house-proud, just for that wall. No one seemed to notice that it wasn’t sticking properly just above the skirting board where I think we had been running out of paste. The enjoyment turned out to be short lived. At the front of the house, a damp patch seemed to be getting bigger. It was between the stairs and the front door and dried out when the central heating was on but always came back. We had checked for leaks and unblocked the airbrick, but the damp area persisted. We called the guys in. It was bad news. We needed a new damp core all along the outside wall from the front door to the beginning of the kitchen extension, which was unaffected. 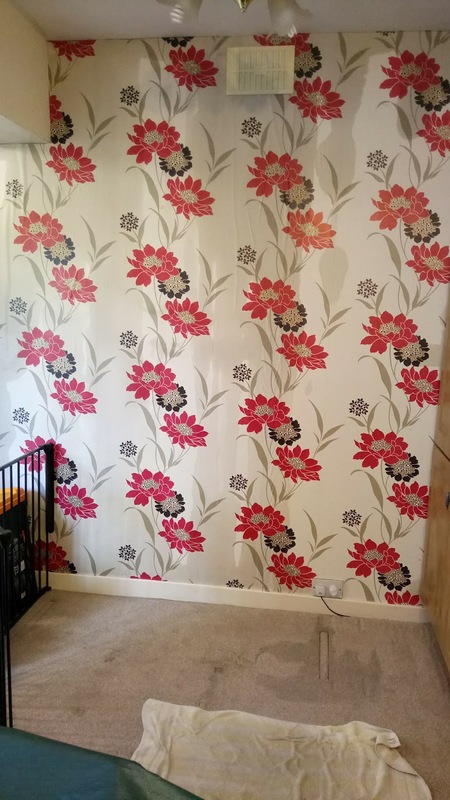 It had to be done, so it was a sad goodbye to the lovely wallpaper but that was nothing compared to the dismantling of fitted cupboards and the walls taken back to the brickwork. It was easier for our builders to replace the downstairs loo and basin with new ones, rather than trying to salvage anything. Crumbled plaster and smashed tiles. What a mess, but soon sorted. This is where one job leads to another. The rest of the hall and the stairs and landing had to be prepared for redecorating. Year in and year out, we had painted the walls over the same wallpaper. It was as thick as cardboard and hard work to get off, even with a couple of steamers, but to see the various pale shades we thought were nice at the time was amusing. I don’t remember ever choosing a wishy-washy pink, but there it was and Regency Cream had quickly turned yellow. The mushroomy off-white was a mistake, magnolia would have been better. Eventually, everywhere was painted white on to the newly skimmed plaster and that is how it has stayed. We papered the feature wall with another large, floral pattern, which isn’t as good as the original, but it would do. Unfortunately, we had another flood in the bathroom, nothing to do with children and nothing that could have been prevented. Once again, the only wallpapered wall is the casualty. I’m glad we have a reliable plumber. It has dried out leaving wrinkles, bubbles and a few streaky marks. For now it can stay like that. I can’t see the damage as well as everyone else can. I found this poem. It reminded me of the memories we shared when we tackled the hall. faded adorn—a story of life. by time reduced to dust. I thought your choice of poem was interesting, as much for the structure as the sentiments. Thank you.